On Sunday 24 June the club travelled to the village of Ballycotton. Leaving town at 09.00 we travelled to the beautiful rich countryside of East Cork. 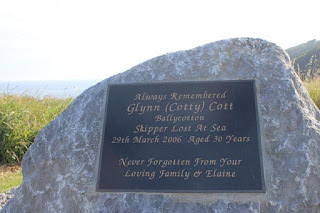 We parked up at Bayview Hotel and had the usual cuppa in the outdoors area overlooking a Mediterranean blue sun-kissed sea.
. A stark reminder at the start of the walk of how unforgiving the sea can be is a plaque to a young skipper who lost his life in 2006. Also at the start is the decommissioned lifeboat the Mary Stanford which served in Ballycotton from 1930 to 1959 saving many lives during that time. 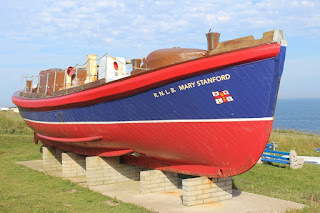 This boat and it’s crew took part in the ledgendary rescue of the Daunt Rock lightship which broke it's moorings in the 7 Feb. 1936 bringing all eight crew members home. For their efforts, the crew were awarded Gold, Silver and Bronze medals for bravery. The boat also got a medal for gallantry, the only one ever to be awarded to a lifeboat. 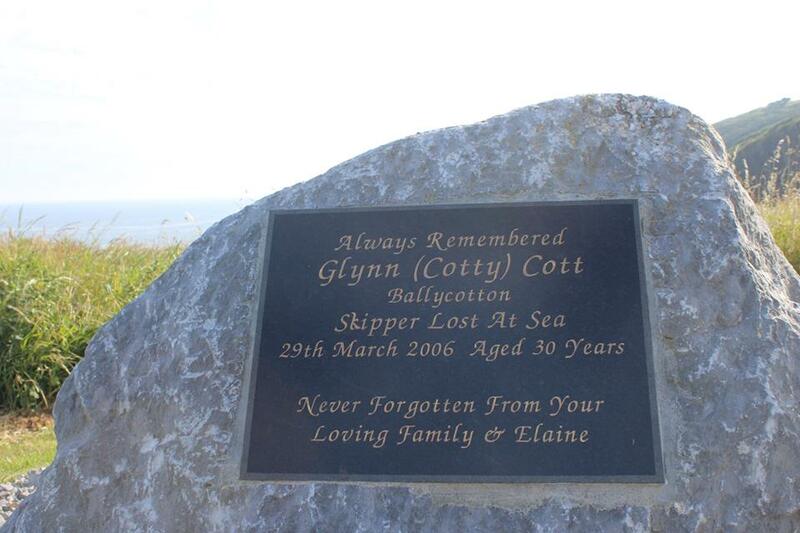 There is a plaque telling the story by the boat, it is fascinating reading. Today the sea was benign. The cliff walk meanders through meadows and farmland it hugs the cliff edge. 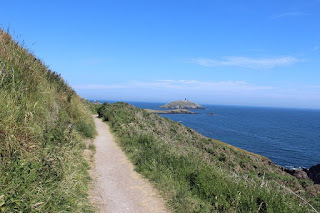 The path is a narrow well-worn track that gives great views, out to the Lighthouse on the island in the Harbour. It is a pleasant stroll overlooking the ocean, and fertile fields of East Cork. Along the path, there is a plaque commemorating the loss of the barque Colleen, her captain, Captain Bartlett and nine crew when it foundered off Smiths rock in 8 Jan. 1894. Another reminder of the dangers of the sea. The well-trodden path continues to Ballyandreen strand with wildflowers in bloom along the way. Each indentation, headland, etc has it’s own name. These are named on an information board at the start of the walk. Names include Long Channel, Weare Cove, Cradle and Table no doubt of great importance to the sailors who sail these seas. When we reached Ballyandreen strand we retraced our steps back. This could also be a loop walk but we didn’t want any road walking. When we returned to the cars it was decided to go to Garryvoe for a beach walk. However, when we got there the tide was in and the beach was packed. Rather than walking through sun worshipers and screaming toddlers we upped and continued to Shanagarry to the Kilkenny shop for retail therapy. Shopping done we had a nice meal there and then continued on to Ballymaloe House. Here we enjoyed a walk in the grounds, before a final cup of coffee for the road home. A very enjoyable day out, good to see some new faces. Sadly the gender balance was completely out of kilter. It’s hard enough for a man to wait around for one woman shopping, try going with six.